The beautiful thing about decorating sugar cookies is the satisfaction when you admire your colorful gingerbread man just before biting off his delicious head. The not so wonderful thing is that it takes quite a long time to decorate. You can bake the cookies one day in advance and let them cool thoroughly over night. And then you can spend all the day hanging out with your painting crew, slowly decorating the cookies. Actually I've made it sound harder than it is. A lot of the time is spent waiting for the layers of icing to harden up enough before the next layer. The next tip is the Chopstick Tip. What the hey, you say?! Well, my little girl had trouble using the squeeze bottle (filled with icing) as her hand is still quite small. Actually I had trouble with them as well as they sometimes were hard to control. So we invented the Chopstick tip which is basically using the chop stick to nudge and smooth the icing to the edges when flooding and, most importantly, to add the final detail decorations. Just dip the chopstick in the color you want and decorate away! Much easier to control (you can do dots and lines and all kinds of artistic smudges) and feels much fun, like you're painting. We did all the decorations on the cookies here with chopsticks, except for the initial outlining in white icing. The last tip is the Dry It Tip. Just remember to let each layer dry before adding on the next layer. Easy Peasy! Yup, lots of fun creative work but it sure pays off in the end when you have a holiday cookie jar full of twinkling Christmas trees, naughty gingerbread men, cute cuddly bears and polka dotted stockings! 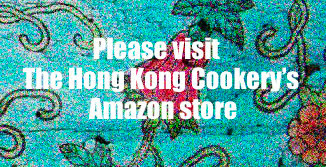 Yeah for Christmas Sugar Cookies and Merry Christmas from all of us at The Hong Kong Cookery! Allow butter to soften by leaving out for a couple of hours. (I just leave it on the counter overnight.) Cream softened butter and sugar together. Add egg and extract and mix. Mix flour with baking powder and salt, then add, little by little to the wet mix until incorporated. The dough should not stick. If sticky add a bit more flour until the dough doesn't stick to the bowl or fingertips. Allow dough to rest 5 minutes. Flour working surface and roll dough out to 1/4" thickness. (If you can get one of these rolling pins you will have a perfect thickness.) Cut out cookie shapes and bake at 400F or 204C for 7-8 minutes. Cookies should not brown. Allow to cool completely before decorating. Beat egg whites and vanilla til frothy. Add the sugar little by little until incorporated and shiny. Using high speed beat till soft peaks form, about 5 minutes. Separate icing to different bowls (one bowl for each color) and add desired food coloring and mix. Reserve a small bowl of uncolored icing for later use. At this stage the icing should be the correct thickness (like toothpaste thickness) for outlining the cookies. Use small squeeze bottles filled with icing to pipe out the cookie outlines or draw in details. Tip: To adjust icing, add either more icing sugar (thicker) or very small amounts of water* (thinner). Use a water spray bottle to add water to icing if needed. Much easier to control the water amount. If flooding cookies (ie completely covering the cookie with a thin layer of icing), wait until the outlines of cookies are completely dry. (The outlines keep the flooded icing from spilling over the edge.) Thin out icing by adding small amounts of water until the thickness of honey and then pour a bit of icing within your piped outline, use spatula or chopstick to spread out and nudge the icing to meet the outline. Repeat until the whole outline is filled. Let dry completely before next stage. Leave bowls of icing uncovered so that by the time your flooded cookies are dry, the icing will have thickened up a bit. Test thickness by dipping chopstick in and making a dot with it. If the dot holds its shape the consistency is good. If too thin, add some reserved white icing to thicken it up. If too thick add a bit of water. Once you have the right consistency, use chopstick and/or squeeze bottle to add the final decorations. Hope you have as much fun with this as we did!